​We are so happy that you have decided to join the Baxter Creek Family! If you have made an appointment with us, or are planning on making an appointment with us, click here to download and print our New Client form. Be sure to bring the form with you to your pet's first visit! The biggest compliment we can receive is the referral of a family member or friend. 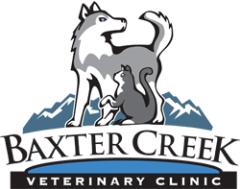 We want to thank our Baxter Creek Family who have been devoted to helping our clinic grow and for trusting in the quality of care we provide with our referral rewards program. For each referral you send to us, you will receive a $10 credit on your account for future veterinary care.